Today was one of my few days at home which meant a chance to catch up on post and email. I was hoping to get the new oak desk top fitted as well having spent three weeks oiling it but that failed, I upturned the raise and lower one with the ugly black MDF top only to discover that I needed a T30 Starbit to remove it. I ordered one from Amazon but that meant putting everything back together again which was a pain and putting the job off for a week or so. 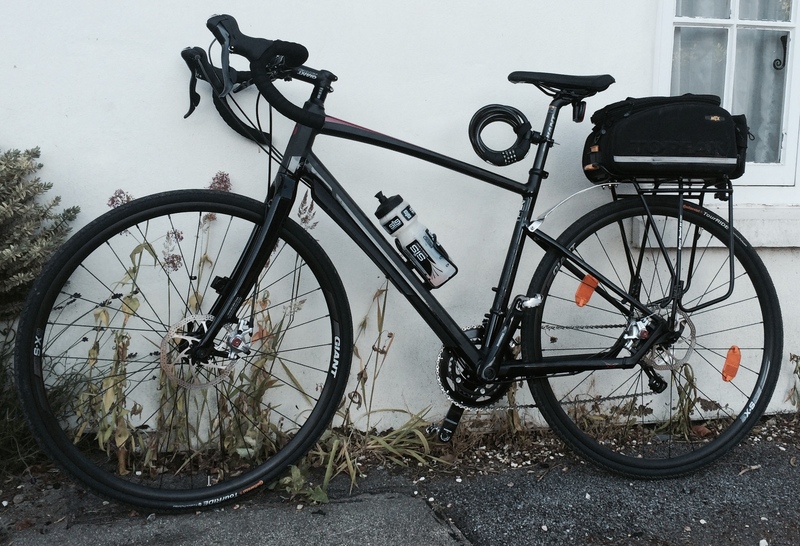 I did however manage to get out for a longish ride on the new cycle-cross bike. I’m selling my old hybrid (cheap to a good home which has served me well the last couple of years but is really designed for shorter rides. I have some ambition this year, or more likely next to ride Lon Lâs Cymru over four or five days and that involves some rough tracks as well as roads. So my audax bike, made to measure, super thin tyres etc. would not be able to make it. The hybrid would not be fast enough or comfortable enough hence the swap. I got the cycle cross with touring tyres not off road ones as most of what I do is road with the off canal tow path and farm track thrown in. For that its a good compromise and these days the braking systems are much better. Gear technology has also developed to the point where you only need two cogs at the front so generally an all round improvement. I still love the audax bike however and it is so much faster, if a little scary at speed given the old style breaking system. Its pictured to the right and I’ve been using it exclusively for a period. In the main to get the miles in to settle it down and take it back for its first free service before winter sets in. It’s also tough enough for winter riding which is good, as long as I can match it. Wiltshire is good cycling territory, less so for walking. Ok there are good walks but none of them challenging or for that matter with much variation in height. But for cycling you can’t do much better. From my house I have multiple circular routes that vary from 20 to 150 kilometres all of which are different. My standard route (now healthy I am back to going out daily if I am at home) starts up the lanes from Lockeridge and over the Clinch Common before a rapid descent. From there depending on mood, weather and available time I can do a full 50km run (pictured in the opening shot) or cut through All Cannings for 40km or straight through Alton Priors for 30km which is about the shortest route I find enjoyable. All three of those involve a final climb up Pewsey Down, then a long run back to the house on a gentle gradient. I’m starting to put together notes for a small self-published book on circular rides from the Whoda’ Thought It, the pub opposite my house. The pleasure of road cycling is rather like long distance walking, after the first hour your body and mind move into a type of harmony with themselves, the activity and the environment which it is difficult to describe. You don’t get it with mountain biking where the pleasures are different and the nature of attention prevents the same reflective capability while providing other enjoyments. I’m finding that in the afternoon, when a days work starts to allow you down its a great way of getting up and going again intellectually. You solve problems as you ride, the problem is sneaking the iPhone out to record them while trying to maintain a 20 Kilometer per hour average speed! So this post is a declaration of intent to start by documenting them here. I may even buy one of those cameras and record each of them as a supplement.